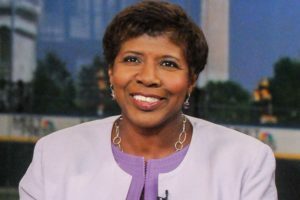 Gwen Ifill, a trailblazing political journalist, died on Monday at a hospice in Washington. She was 61. The cause was complications of uterine cancer, her brother Roberto said. Ms. Ifill broke barriers as a black woman in a field dominated by white men. She achieved her highest visibility most recently, as the moderator and managing editor of the public affairs program “Washington Week” on PBS and the co-anchor and co-managing editor, with Judy Woodruff, of “NewsHour,” competing with the major broadcast and cable networks for the nightly news viewership. They were the first all-female anchor team on network nightly news. Last spring, she and Ms. Woodruff were the moderators of a Democratic primary debate between former Secretary of State Hillary Clinton and Senator Bernie Sanders, reprising a role that Ms. Ifill had performed solo between sparring vice-presidential candidates in the 2004 and 2008 general election campaigns.